Turn everyday situations into incredible moments withTimelapse. Shoot blooming flowers and rolling clouds, recording all their movements in a stable shot. For an evenmore dynamic effect, Motionlapse lets you move with the camera while creating equally smooth video. For aspiring filmmakers, a new built-in zoom slider lets you completely operate your smartphone camera from the handlewith more fluid, cinematic zoom. You can even produce dollyzoom — a visual effect that only professional film sets could produce. Go live! With up to 15 hours of battery life, the Osmo Mobile 2 can also charge your smartphone for hours of streaming. Beautify mode also keeps you looking great in front of the camera. Now you can take your story anywhere. The Osmo Mobile 2 is made of a high-strength composite material cuts the weight to just 485g, perfect for all-day use. Also, its modified design now supports more compact folding for increased portability. 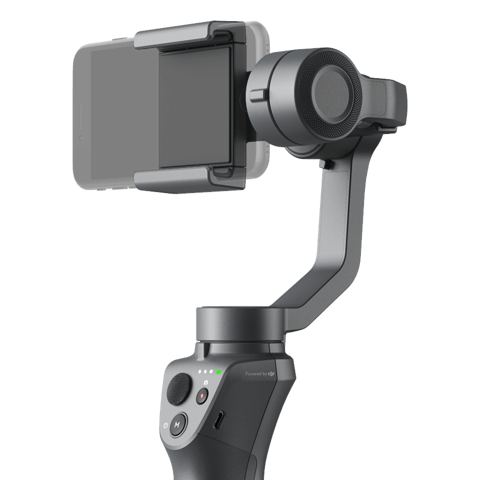 Move, shoot, and share with the Osmo Mobile 2. 1. Under ideal conditions with the gimbal fully balanced.